As from 1st April 2019, Making Tax Digital (MTD) for VAT will swing into action. This means that for all businesses that have an annual taxable turnover of over £85,000, ie taxable supplies that are either standard, reduced rate or zero rated, they will be compelled to keep their records digitally unless they are deferred for six months or exempt. They will also have to file their VAT returns using MTD-compatible software. Those businesses that have been part of the MTD pilot are already mandated to use the service from April 2019. It is important to realise that VAT registered businesses are not automatically signed up to MTD and must therefore ensure that they enrol by visiting Sign up for MTD. HMRC will send a confirmation e-mail within 72 hours of signing up. The timing of signing up is crucial, as signing up too early can create problems. Only VAT periods starting on or after 1st April 2019 are affected, so if a business signs up in March in the belief this is required in readiness for the changes, its March 2019 VAT return would have to be filed using MTD software and not via the HMRC portal. For the majority of businesses that file VAT returns quarterly, their first MTD returns won’t be due until August 2019 or later. For those businesses that already use accounting software or spreadsheets to maintain their VAT records, they may not notice a great deal of difference but they will need to ensure that their software is MTD-compatible. 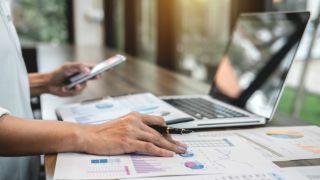 The good news is that spreadsheets can continue to be used for the foreseeable future but ‘bridging software’ is likely to be required to make them MTD-compatible. Contractors using the flat rate scheme will not be required to keep digital records of supplies received unless they relate to capital items which cost most than £2,000 (including VAT). Digital record keeping does not require businesses to scan and store invoices and receipts digitally, so businesses can continue to keep documents in paper form should they wish to do so but each transaction will need to be recorded and stored digitally. Compatible software is a software product or set of software products that between them support the obligations of digital record keeping and exchanging data with HMRC through the MTD service. ‘Bridging software’, which will be required where spreadsheets are used, is the term used by HMRC for the digital tool that can take information from other applications, such as spreadsheets or an in-house record keeping system, and allows the user to send the required information digitally to HMRC in the correct format. HMRC say that there are MTD-compatible solutions available at little or no cost for most businesses, with 11 products available for free with varying conditions of use. Read the small print as it is very rate to get something for nothing nowadays! Those organisations with more complex VAT affairs, for example, trusts, not for profit organisations, local authorities, are not required to join in until 1st October 2019. HMRC has written to all those that fall into this category. For those organisations that have received such a letter it is vital that they keep this in a safe place because it represents the legal permission for deferral. For those falling in this category who have yet to receive a letter, then they should contact the VAT helpline otherwise they will have to comply with MTD from April. There is an automatic exemption from MTD for a business that currently is not required to file their VAT return online, and therefore they do not need to take any action. For others that feel that they should be exempt, they must contact the VAT helpline or write to HMRC VAT Written Enquiries Team in Glasgow. their business is run entirely by practising members of a religious society or order whose beliefs are incompatible with using electronic communications or keeping electronic records. Further information can be found in VAT Notice 700/22. HMRC have confirmed that there will be a ‘soft landing period’ of one year to allow businesses time to implement digital links between all parts of their MTD-compatible software. During this period, where such a link has not been established between software programs, HMRC will accept the use of cut and paste as being a digital link. Recognising that businesses will require time to familiarise themselves with the new requirements of MTD, the department will also take a ‘light touch’ approach to digital record keeping and filing penalties during the first year of mandation, where businesses are doing their best to comply with the new rules. It’s not Big Brother, yet! There is a myth that under MTD, businesses will have to provide more information than they already do. This is not so. HMRC will only receive the figures in the nine boxes of the VAT return as it always has done. Businesses whose turnover is below the VAT registration threshold of £85,000 but are voluntary VAT registered will be able to choose whether to join MTD. Hopefully most businesses will have heard about MTD by now even if they don’t fully understand the implications. The time to get fully acquainted with the requirements is now so that the business can gear up and owners will not be left panicking.